Your track rollers are oval or blocked? you observed oil leaks? The ride is not operational? For most steel track machines for public work we have what you need! 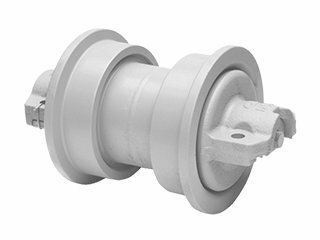 CODIMATRA specializing in the purchase and sale of used spare parts and equipment for public works, has selected a complete range of upper and lower track rollers compatible with most existing models. What is a track rollers ? A toothed wheel, called sprocket is connected to a motor shaft. It is what will directly lead to the track. It will be held under tension by a tensioning cylinder and an idler wheel. On some construction equipment, the tension will be delivered by a grease cylinder or by low pressure hydraulic cylinders systems (for larger). The track rollers, also called roller guides (to keep track). The rollers are very important organs of a chain running gear. They support alone the whole weight of the craft in confrontation with the environment in which they find themselves. The upper rollers support the chain weight so that it does not sag. The rotation thereof is made by the weight of the chain on the bearing. The rollers are permanently lubricated on pre -lubricated Tracked models by a red oil contained in the body of the roller and in the body of the axis of easily recognizable when there is a leak. More the TP machine is heavy and large, more there will be track rollers. However, maintenance is not easy on this type of part. Even permanently lubricated, visual inspection is not easy on such bodies. In addition, if there is a box frame welded to the frame, the track rollers are hidden. In short, track roller bearing are prime wear parts to check ! A large range of track rollers at Codimatra ! Our dedicated roller list is updated daily so that each customer can find the product that perfectly matches his machine. To advise you for the choice of the roller model you need, call on the expertise and professionalism of the teams CODIMATRA. They are at your disposal to answer all your questions or for any further information.